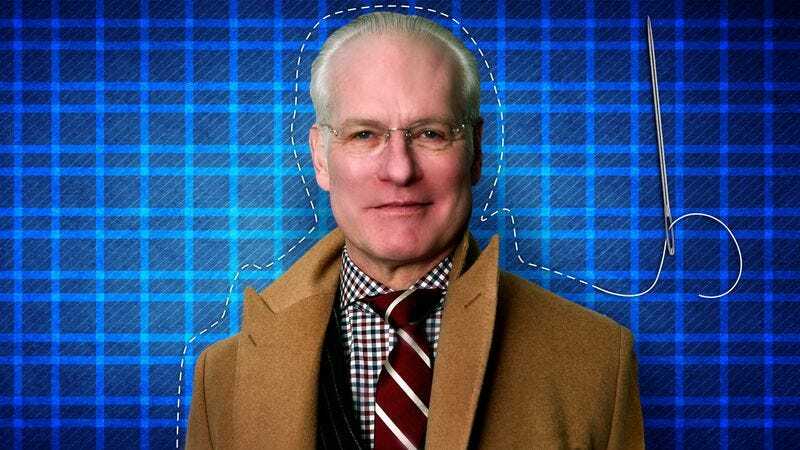 When Tim Gunn made his public debut on Project Runway in 2004, he was a breath of fresh air for reality TV. A loving and supportive outsider with a history in academia and a distrust of sensationalism, Gunn became the model for what it meant to be a credible reality TV mentor. He could be a contestant’s friend, sure, but he could also be their harshest critic, pushing those who were slacking to think bigger and work harder. (See: Swapnil, the smoking-obsessed shitbag from last season of Runway.) Gunn was also an audience favorite, and his genuine mannerisms, from “Make it work” to his sweeping tone of voice, have become semi-secret clubhouse handshakes for those who are in the know about how great Gunn is. Tomorrow, Project Runway kicks off its 15th season. Now on Lifetime, the show still churns out great designers, having made names out of everyone from Christian Siriano to Ashley Nell Tipton. In anticipation of the premiere, The A.V. Club thought it high time we ask Gunn our 11 questions, and the answers are as delightful as one might expect. Tim Gunn: Heavens! What’s a question I’d like an interviewer to ask me? I suppose it would be along the lines of, “What are you engaged in that would surprise most people?,” and the answer to that is that about eight months ago, and at age 62—I’m at now age 63—I took up fencing. AVC: How did you get into that? TG: In the most unlikely way possible. Fencing was nowhere in my vocabulary. I was having an interview to promote Project Runway Junior last fall, and I was in the green room with the interviewer. He knew all about me, and I said, “Tell me about you!” He said, “My name is Tim Morehouse, I’m a three-time Olympian, and a silver medalist in sabre fencing, and I just opened a fencing club.” “What’s a fencing club?” I said I wanted to come visit him, and I did, and I observed, and then I took him to lunch at a diner around the corner. During lunch I asked him, “Could I be your oldest student?” He said sure, so I thought, “Let me try this.” I love the history of the sport, I love the culture that surrounds it, and I never dreamed I’d become a fanatic. I’m such a fanatic now that I’m committed to competing. I mean, it’ll be two or three years from now, but I really want to compete in my age group. I never dreamed I’d become a jock! AVC: I’ve taken a couple of fencing classes and it uses muscles that you didn’t know you weren’t using. TG: You know, then! It’s all counterintuitive. All of it. Exactly. There’s nothing about it that’s intuitive. You’re right, you’re using muscles you’ve never ever used. Which weapon were you fencing? AVC: We did all of them. It was just an intro class. TG: Oh, okay. I’ve only fenced sabre, but I’ve come to learn more recently that epee and foil are so incredibly different—from where you can touch someone to the actual movements you can make. It’s quite interesting. AVC: How are you going to get ready to compete? He did come out the set once, because he presented a challenge for Project Runway Junior to be inspired by the fencing uniform. It was an avant-garde challenge. The best avant-garde work in the history of the show came out of these teens. It was just remarkable. At any rate, I’ve been on hiatus, so in order to really get ready to compete, as Tim says, it’s not a matter of time, it’s not a matter of two or three years, it’s a matter of how many hours a week are you putting into this. It’s a big commitment. Eventually, and this goes back to what we were both saying about how you’re using muscles you wouldn’t use otherwise, but eventually, muscle memory will kick in, and these movements will become more intuitive, and that’s what I’m waiting for. [Laughs.] I’m desperately waiting for muscle memory. TG: God, I feel like it would be animal abuse to ride an animal to work during the day. Boy, these are challenging questions! How about a woolly mammoth? I figure a woolly mammoth would like the journey, and is used to it, and is well padded and insulated. AVC: And in New York, no one would blink an eye. TG: You’re actually right. No one would blink a single solitary eye. TG: Oh, The Wizard Of Oz. AVC: Why The Wizard Of Oz? TG: When I was a kid, every Easter weekend—for some reason it was Easter, I don’t know why—it would air on television. This was in the olden days where you didn’t have DVR, and you didn’t have DVDs. It was annual ritual. It was a love/hate situation for me. I used to watch it under a blanket, and peek out every now and then because it scared the living daylights out of me. I own a DVD of it now and I watch it occasionally. I’ve seen it probably 50 or 60 times. I find the movie to be such an uplifting story of tenacity and perseverance and dreams. It’s dark, has some humor in it, and it never ceases to captivate me in the end. I always feel as though, in some ways, I haven’t seen it before, it’s so arresting. Also, the whole transition from black and white into color, and the fact that it was in 1939? It’s quite remarkable. For me, it has more allure and sensationalism than all these computer-generated things today. I just have great affection for it. AVC: It’s amazing that you can still find new things in the movie all these years later. TG: Yeah! Absolutely agree. When you consider when it was done, how remarkable is that technology? I can only imagine what it must have been like to be in the movie theater watching that. TG: You know, there are so many myths. As I continue to mature and navigate the world, there are so many myths that are dispelled for me. I’ll get to one. Just let me ponder this for a few more seconds. AVC: We can come back to it, too. TG: Would you mind? I’ll ponder while we continue to talk. TG: That I’m a fashion designer. And I am not. People make these assumptions. I’m frequently introduced as a fashion designer, and I quickly say I’m not, and instantly people are incredibly disappointed and think that I’m some sort of charlatan who’s been perpetuating this falsehood. I’m like, “No, no, no, I’ve never said I’m a fashion designer.” In fact, I think the reason I was successful chairing the fashion department at Parsons and later in this role on Project Runway is because I don’t have an ax to grind. I don’t have my own personal educational experiences in fashion to use as the template for what a fashion education should be. When I rebuilt the curriculum at Parsons it was all based on dozens and dozens of conversations with people in the industry, from designers to editors to merchants, on what is needed to really lead the industry, not just get a job. And what’s important to a fashion designer? It’s much more than learning how to make clothes. In fact, that merely makes you a dressmaker. It doesn’t make you into a fashion designer. I like my neutrality. In terms of my role on Project Runway, the designers on the show can’t look at me and say, “What are you talking about? I’ve seen your work, and it’s not exactly what I would call innovative or fashion forward.” So, I like and enjoy my position of neutrality. AVC: It’s good to know what your strengths are and what you can and what you can’t do. TG: Absolutely. And what you don’t want to do. If I had to make an article of clothing I could certainly do it, because I taught three-dimensional design for almost three decades and one of the areas we covered was soft structures. I would have the students make a slipcover or some strange object so that they understood soft three dimensions and construction using textiles, but it wasn’t an article of clothing. You bring so much baggage to that because we wear clothes, so think about it abstractly. TG: Oh, easy, easy! When I was at Parsons, in addition to teaching I was associate dean, and among my associate dean responsibilities was the oversight of our affiliates, which were all over the place. I was actively involved in the development of our affiliate in Seoul, in South Korea. While there, I was served a living sea slug. It crawled off my plate, and I put my plate on top of it, and my elbow on the plate. AVC: And you still ate it? TG: No. Do I have to have eaten it? AVC: No, that’s fine. You have to know where to draw the line. TG: Yeah, a living sea slug. It was really where I drew the line, because I had been eating things during the week and my hosts were laughing and saying, “Ha ha, you just ate the womb of the fish,” and “Ha ha ha, you just ate such and such.” And I thought, “Oh my God, I can’t keep doing this.” So, I drew the line at the sea slug. In fact, moving food is, I think, probably never a good thing. 7. What’s the first concert you went to? TG: Any kind of concert? AVC: Any kind of concert. Perhaps the first one you went to on your own? TG: Well, believe it or not, I and a group of my boarding school colleagues got into a van in 1969 and went to Woodstock in our Weejuns [penny loafers] and gray slacks and blue blazers. AVC: It sounds like you might have stuck out. TG: Yeah, we looked like complete and total fools. We got out of the van and we were up to our shins in mud. AVC: At least you got there. A lot of people were stuck on the road. TG: Yeah, we got there. We were there for a couple of hours and turned back. That was enough for us. I mean, I’m happy to say I was there. AVC: What do you remember from it? It was probably pretty overwhelming. TG: I just remember feeling that I needed hot running water and a plastic drop cloth to wrap around me. It was a rough and ready environment, with a lot of really filthy people. I just mean filthy because of the conditions of the whole environment. And we weren’t stoned, and we weren’t… well, I guess we weren’t stoned! That probably would have helped tremendously. TG: I’ll tell you one of the most thrilling things that ever happened to me through my work. I was one of the hosts of a very short-lived ABC daytime show called The Revolution, and it was the most challenging professional experience I’ve ever had, and that’s a euphemism for saying it was the most horrible professional experience I’ve ever had. But things happen for a reason, and there were lots of things that I learned from that experience that were great. [During that time] I flew to Nashville and interviewed Dolly Parton. I’m going to have chills right now telling you about it! It was so thrilling, so exhilarating. She is such a phenomenal human being, we had such a great time, and I will always have a smile on my face whenever I think about that experience. AVC: That’s a lesson for all of us. TG: Exactly! Did you know she does all of her own hair and makeup? She doesn’t have people. I love that about her, too. She’s a self-cleaning oven! TG: Oh god. How much time do we have? I’m still going through them. Well, in some ways, it’s really awful to talk about. I grew up with an absolutely horrible, debilitating stutter, and it was what caused me to retreat into myself and caused me to have very few friends and not want to socialize, and it made me absolutely terrified of giving reports in school. It was awful. It wasn’t until I was 19 that I had intensive speech therapy. I had it for two years and it really helped, though I will say when I’m tired, the stutter comes out, even now. That was it for me. It formed my whole life in so many ways. TG: It caused me to be antisocial and withdrawn because I didn’t want to talk, because whenever I opened my mouth invariably someone in the room would start laughing. I mean, it was painful to listen to. Painful. I remember giving a report on Mississippi and being incapable of getting that word out, and of course it was at the beginning of the report. I still remember it vividly. It was the fifth or sixth grade. Awful. Awful. TG: Yes! I was a really little kid, and we were at the checkout line at a drugstore. It was Halloween and there were these little penny candies in tiny cellophane bags, and I really wanted the candy corn that was chocolate and orange with the little orange tips. My mother said no, and I took one. I was up all night and the next morning went into my parents’ room. Dad had already gone to work and I was holding [the candy] in the palm of my hand. I burst into tears and said, “I’ve done something terrible,” and we went back to the store and asked to see the manager and I turned it in. AVC: That’s funny that you had so much guilt about it. It wasn’t that you got caught. It’s that you had so much guilt that you couldn’t enjoy it. 11. Who is the most famous person you’ve ever met? TG: I’m so lucky. I’ve met a lot of famous people. I guess the most famous person I was so extremely exhilarated by being with—and actually sat next to her at a luncheon at the White House—was Mrs. Obama. AVC: Ooh, Michelle Obama. That’s a good one. Is she everything you hoped? TG: And more, yes. Even more. I mean, I reached out my hands to shake hers and she threw her arms around me and gave me a great big hug and a kiss. AVC: She reminds us that if she has the capacity to do more, we have the capacity to do more. TG: Well, I’m making the assumption that after she leaves the White House that she will continue all of her work toward improving education in this nation and childhood health. TG: Exactly. At least they have a nice house to go to. Is it Malia that still has to graduate from Sidwell Friends? I think so. [It’s Sasha Obama. —ed.] But now I’m terrified about Mrs. Clinton’s health. AVC: I’m a little concerned, but I don’t want to be too concerned. She has the best access to doctors one can have. TG: That is true. There was an op-ed somewhere this morning that was pretty good. I got a notice about it saying, “Mrs. Clinton unconscious will be a better president than Donald Trump fully conscious.” [Laughs.] And I thought the same thing. That’s very likely to be true. AVC: This morning, the radio was airing some clips of George W. Bush talking about how the Afghanistan War has gone on a long time. Now he doesn’t seem like this evil horrible person, because we know that there actually is someone who could do a worse job than him. Bonus 12th question from Emeril Lagasse: What is your favorite New Orleans dish? TG: Oh god, what are those fabulous sugar-coated doughy things? TG: Yes, that’s it. Beignets. Yup. And I’m not even a dessert person. TG: Exactly. And one is too many and a dozen aren’t enough. TG: What do I want to ask the next person? If you could relive one day in your life, what day would it be? You know, I still owe you an answer to another question. Now I’m thinking as my brain keeps circulating and circulating and circulating. AVC: Do you have an answer for your question? TG: I’ll tell you, I actually don’t, and it may be why I asked the question. I’ll tell you why I don’t. I really believe—and my mother hated it when I would say this, and I say it a lot—but I really believe things happen for a reason, and sometimes that reason isn’t revealed until much much, much, much later. Someone once asked me a different question: “Is there an event in your life with someone in your life that you would want to amend or want to change?” I said, “Absolutely not.” And they said, “What do you mean? Have you not lost anyone? Has someone close to you not died?” At that point I had just lost my father, but my mother was still alive. I said, “No, I wouldn’t alter the death of my father, I wouldn’t have that reverse itself,” and they asked why. I said because—on this topic of things happen for a reason—my mother and my sister and I developed a whole new dimension of our relationship, owing to that loss. I said, “It’s been very special and very wonderful and I would deduce it wouldn’t have happened if my father hadn’t passed. So no, I wouldn’t change anything.” When it comes to reliving something, I think, perhaps just going back, not to change it, but to enjoy the same emotions and thrill it would have to be something happy, like winning an Emmy, or something along those lines, where you just get to experience it again. A birthday celebration. AVC: Yeah, but it might not be enough. You wouldn’t experience it as intensely as the first time you experienced it. TG: Well, that’s very true. You wouldn’t. What was the question that stumped me? AVC: What was a stupid thing you incorrectly believed for a long time? TG: Oh, I’ll tell you. It was another embarrassing moment in childhood. I was born on July 29th. My father was born on July 16th. He is a Cancer. I am a Leo. For years, until I was about 11 or 12, I thought that my sign was Cancer because that’s what my father told me, and why would I question him. I had to write a paper or something about my astrological sign. I did, and I presented it with my stutter, all about Cancer. And my teacher said, “You’re not a Cancer! You’re born on July 29th! You’re a Leo!” I was mortified on so many different levels and so profoundly disappointed that my infallible father was in fact fallible. AVC: When you found out you were a Leo, did it click into place? Do you think you have the traits of a Leo, assuming you buy into that sort of stuff? TG: Oh no. I didn’t. To me it was all too abstract and it didn’t have any sort of affect on me. Later, when it became more of a fad to follow astrological charts and signs and look at all of these characteristics, I thought, yeah, I’m much more of a Leo than I am a Cancer. I will say that now. AVC: Well, Tim, it was a pleasure talking to you. Thank you so much. TG: And to you too. This was fun! And totally disarming! I’ve never had a more challenging interview. [These questions are] challenging. They’re very provocative. So thank you for that. AVC: I should say that I can’t wait for the new season of Project Runway. TG: It’s a good season. You may have heard, but I hated last season’s show. I hated every second of it. I thought, “Are we just off our mark? Is this over?” Season 15, we’re back. It’s renewed my faith.